Here is Gal Pal Challenge #3 – Cassie challenged me to make a monochromatic card using a favourite In Colour (they are retiring soon!) and I added the requirement to use metal. I can’t wait to see Cassie’s card; I always love her work. I decided to write a tutorial for this card as I went. Hope you enjoy it! Step 1. Choose where you want your roses to fall on your card. I wanted a diagonal line across the card but not right up to the top corner. I sketched in my line using pencil on the cardstock I will stamp on, pink pirouette. I laid my CS on my cutting mat so you can see the dimensions. 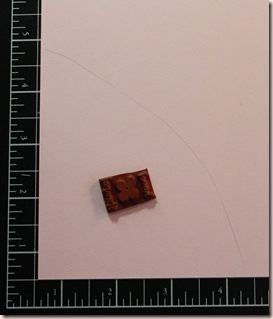 Be sure to note that the card is offset by 1/2” so you could see the numbers if you wish to copy this step of my card. The stamp is only in the photo to help the camera focus because for some reason it was having trouble. I just tossed the closest thing I could grab on there that was small enough to not be in the way. Step 2. 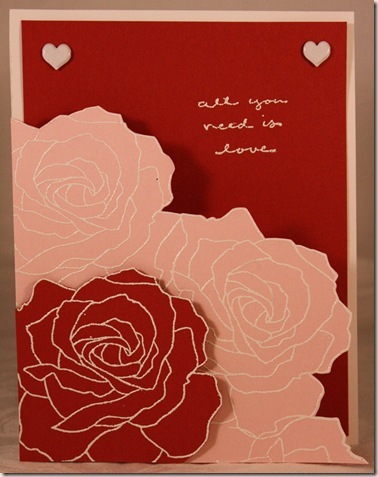 Stamp the rose along the edge in Versamark ink and emboss with white embossing powder. 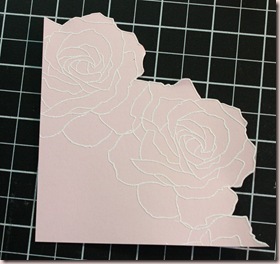 Erase the pencil marks after the powder has cooled and trim the edge closely around the edge of the roses. I chose not to fill in the bottom left corner because it will be covered in the next step. You could fill in this area for an even simpler card if you wish. Step 3. 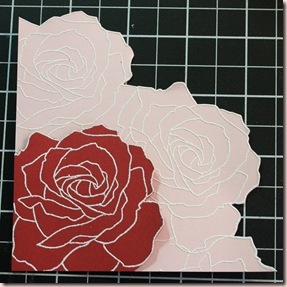 Stamp and emboss a single rose in the corner of riding hood red cardstock as in step 2. Trim around the edge. Apply adhesive to the straight edges. Add a foam dot to the trimmed edge so you get a bit of dimension between the layers. Step 4. Cut and fold a standard CS card. 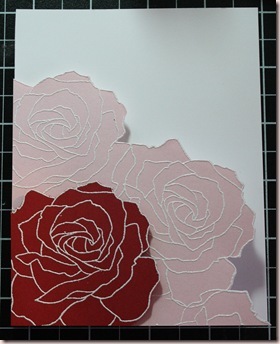 Place the roses over the card front but offset by 1/4” to 3/8” to the bottom left. Trace around the cut edges. 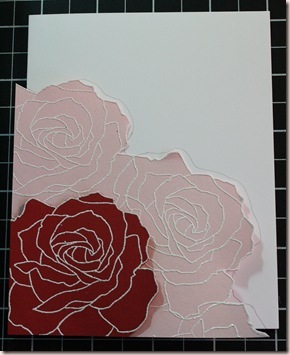 Replace the roses on the card the way they will be adhered and check that your pencil line is all hidden. Correct any areas as needed. Step 5. This shows the pencil line, corrected where needed and shown without the roses. 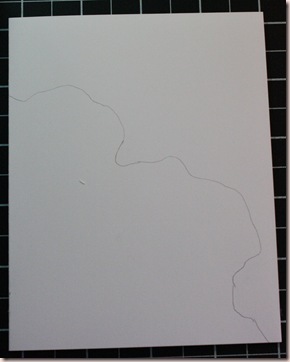 Cut along your pencil line to the fold, then up to the top of the card along the fold. bookplate was too heavy. **SIGH** Ribbon buckle, no… half-back pearls, not metal… URGH!! So I went back to my source of inspiration, a card made by Patti as seen on Julie’s blog, Paper Pleasing Ideas. I added the riding hood red panel on the inside of the card and added two round rhinestone brads. The original brads were square and I didn’t think there was much difference but when I looked at it after placing them, it looked more like headlights. OOOOPS! LOL! So out they went. Then I decided on METAL, white-painted, heart-shaped brads. MUCH better!! Funny, that sentiment looks straight IRL-WEIRD!! I really like the result. Very quick and easy with a very short supply list! Great for beginner stampers! Accessories: 1/16” hole punch, foam dot-Jody Morrow, white EP-UK, heart brads. All products by SU! unless otherwise noted. What a fabulous way to use this stamp set. A striking card. WOW! This card is incredibly dramatic–clean, fresh, graphic–I love it! this is so stunning! beautiful card!